The traditional LP (Liquid Propane), NG (Natural Gas), and charcoal barbecue grill works through convection. Like an oven, the food is cooked by the hot air that rises and circulates around it. What many consumers don’t realize is this convection process tends to dry meat out. We’re not here to say traditional burner systems are inferior or sub-par in any way compared to an infrared burner system. 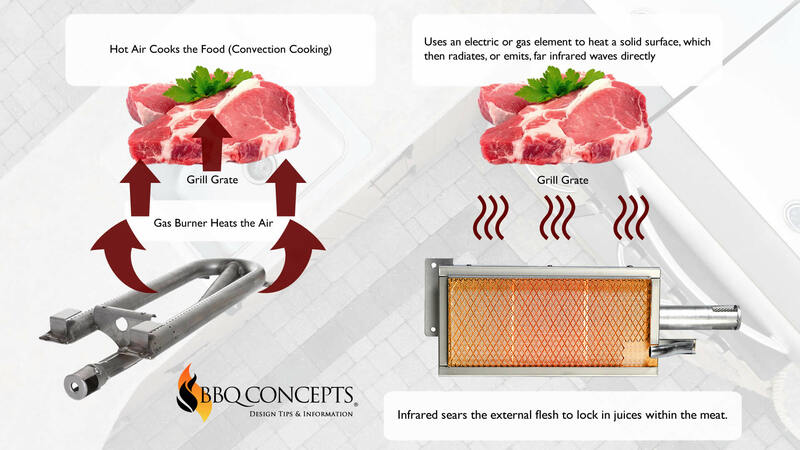 BBQ Concepts is just here to show the primary differences between the two. An infrared burner or grill will cook meat a little differently than your traditional style burners. Infrared relies on an electric or gas element to heat a special emitter plate. This emitter plate then radiates, or emits what is called “far infrared waves”, which are directed at the food. The infrared burner also uses convection style cooking. The only difference between the two is that the infrared heat first sears the outer flesh, this locks in all the juices that make our food so delicious & appetizing. Sear zones or infrared burners can also have variable temperature settings (like a traditional style burner), most simply have one infrared searing temperature. Some chefs and grill masters will use a combination of the infrared searing and the traditional burner. As we mentioned above, the infrared burner is great for searing the meat. When done correctly, this creates a thin seal around the meat that locks the juices in. Then you’re able to finish off the meat over a low flame from a traditional burner system. Ultimately using both burners to achieve different grilling results. Just like anything else, we’re just using the right tools for the job. The traditional burner and convection style of cooking has worked for us since the beginning of time. We recommend exploring a combination barbecue grill with traditional style burners and an infrared unit (or burner) as well. This will help you to achieve better results when grilling. The BBQ Concepts quality and product guarantee, we price match with competitors and guarantee the lowest prices.” When you choose the professionals here at BBQ Concepts, your choosing a local Southern Nevada company that understands the importance of quality customer service and high performance outdoor kitchen products. We’re your friend in the outdoor kitchen industry. Give us a call today to schedule an on-site design consultation.